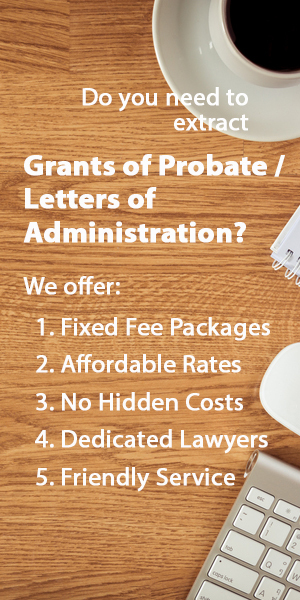 SINGAPORE PROBATE IS NOT A LAW FIRM, AND NEITHER SINGAPORE PROBATE, OUR OFFICERS, EMPLOYEES, AGENTS NOR SUB-CONTRACTORS ARE ACTING AS YOUR SOLICITOR. NOTHING ON THE WEBSITE INCLUDING THE SERVICE WE PROVIDE, INFORMATION, CONTENT, OR DOCUMENTS CONTAINED THEREIN SHALL BE CONSTITUTED AS OR IS A SUBSTITUTE FOR LEGAL ADVICE. THE LAW IS A PERSONAL MATTER, AND NO GENERAL INFORMATION LIKE THE KIND SINGAPORE PROBATE PROVIDES IS SUITABLE FOR EVERY SITUATION. THE CONTENT AVAILABLE ON THE WEBSITE IS MEANT TO BE USED FOR REFERENCE. WE DO NOT REPRESENT, WARRANT OR GUARANTEE THAT THE ARTICLES ARE FIT FOR USE FOR YOUR PURPOSES. IF YOU NEED LEGAL ADVICE FOR YOUR PARTICULAR CIRCUMSTANCES, PLEASE CONSULT A SUITABLY QUALIFIED LAWYER. THE WEBSITE IS NOT INTENDED TO CREATE A SOLICITOR-CLIENT RELATIONSHIP AND, BY USING THE WEBSITE, NO SOLICITOR-CLIENT RELATIONSHIP WILL BE CREATED WITH SINGAPORE PROBATE. The information may also include inaccuracies or typographical errors. Although Singapore Probate will use its reasonable efforts to keep the Website available and the information on the Website reasonably accurate, Singapore Probate and/or its officers and employees make no representations about the suitability, reliability, availability, timeliness, and accuracy of the Services on the Website for any purpose. We do not warrant the accuracy, adequacy or completeness of the Services or the Website for any purpose and hereby expressly disclaim all liability for errors or omissions therein. Singapore Probate reserves the right, without notice and in its sole discretion, to terminate your license to use the Website, and to block or prevent your access to and use of the Website. Singapore Probate reserves the right to refuse service to anyone for any reason at any time. In the event of termination of access to the Website for any reason, you have no right to obtain a copy of any data or communications you stored or effected via the Website, or any other data.